Netscaler binds the username and network password against the Active Directory server to validate the password over LDAP protocol. If network password validation was successful, Netscaler / AGEE binds the username and GridPIN against the GridGuard server to validate the GridPIN. This validation is done over the RADIUS protocol. 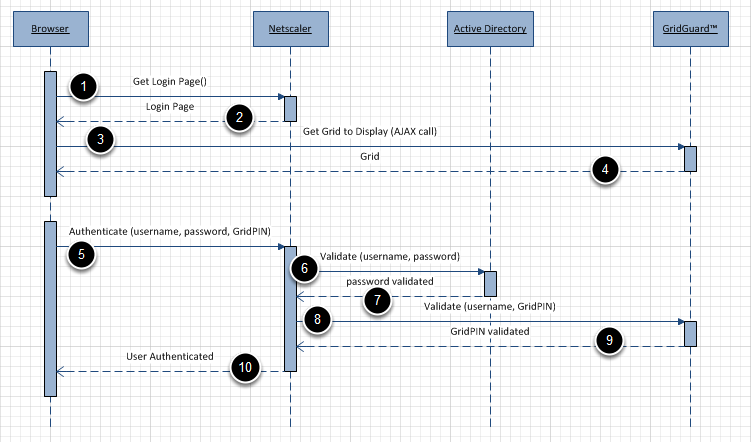 If the GridPIN authentication was successful, user is considered authenticated and given access to the protected resources. If either the password or the GridPIN authentication failed in this process, the user is automatically directed to the password incorrect page and denied access to the system.